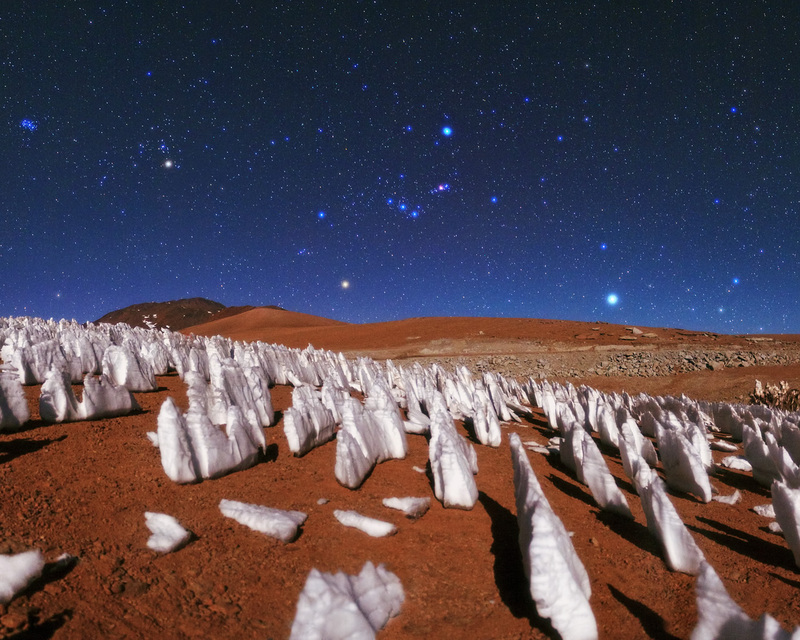 The brilliant starry sky, the red sand and the ice structures piercing the foreground of this image combine to give the impression of a desert far from the reach of human footprints. A landscape that could easily be mistaken for the polar regions of our distant neighbour Mars. 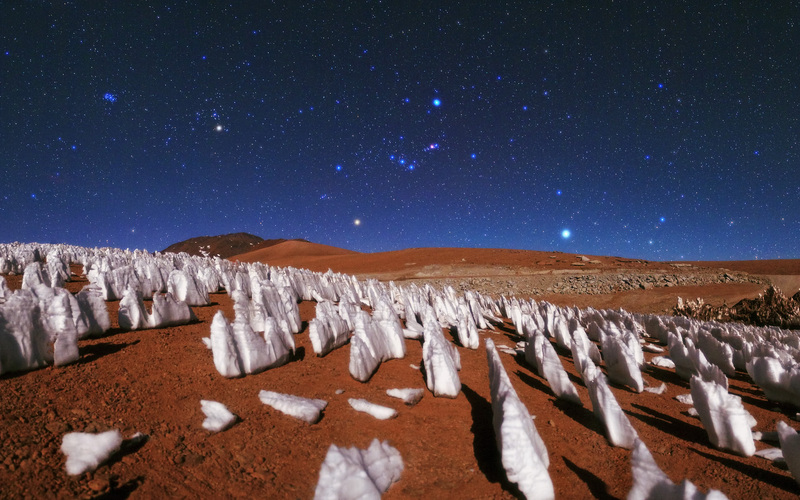 The jagged tooth-like formations are not on the Red Planet however, but on the sloping hills of the Atacama Desert. 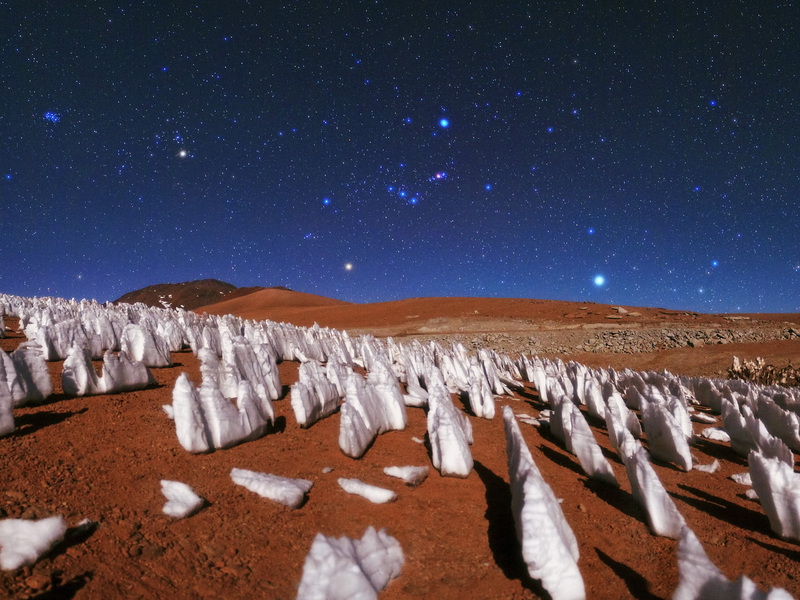 The formations are called penitentes — structures made of snow and ice that form mostly at high altitudes. The low pressure, moisture and temperature at these altitudes help to create this interesting and rare behaviour in the freezing of ice. The strange structures also have a tendency to orient themselves towards the Sun, which is why they are all perfectly aligned like a carefully tended garden of ice. As if this beautiful quirk of nature wasn’t enough, above the structures lies an even more magnificent sight. The large blue star just above the hill is Sirius — the brightest star in the sky. Following the horizon to the left from Sirius, the ancient red supergiant Betelgeuse can be seen, located in the constellation of Orion. The second brightest object after Sirius is Canopus and it is seen here as a brilliant blue point at the right hand side of the frame. This strange and alien-looking image was taken by ESO Photo Ambassador Babak A. Tafreshi.